Quebec environment minister Yves-François Blanchet has ordered the companies behind the Lac-Mégantic rail disaster to pay up. The ordinance, which is a rare use of the government's executive powers, comes into effect immediately. It requires the companies responsible for the crude oil and its transportation to cover the cost of damages linked to the derailment and the ensuing environmental impact. In addition to reimbursing the costs shouldered by Quebec and federal authorities so far, Blanchet says the railway companies are responsible for the major costs ahead, such as recovering the oil from the water and soil, preventing its spread and conducting a study of the environmental impact. Whether or not the companies follow through and cover the expenses, Blanchet promised the costs will not fall on the backs of taxpayers. "If companies do not comply … the Quebec government intends to act immediately on the ground to take care of all decontamination," Blanchet said. "Everything necessary to give the people of Lac-Mégantic back their town and their quality of life will be done," he said. The embattled railway implicated in the Lac-Mégantic train disaster has asked for an extended deadline to respond to one of the potential lawsuits it faces. In all, the U.S.-based Montreal, Maine & Atlantic Railway is now the focus of different attempts at class-action suits and also a police investigation into the July 6 derailment and fire that killed 47 people. 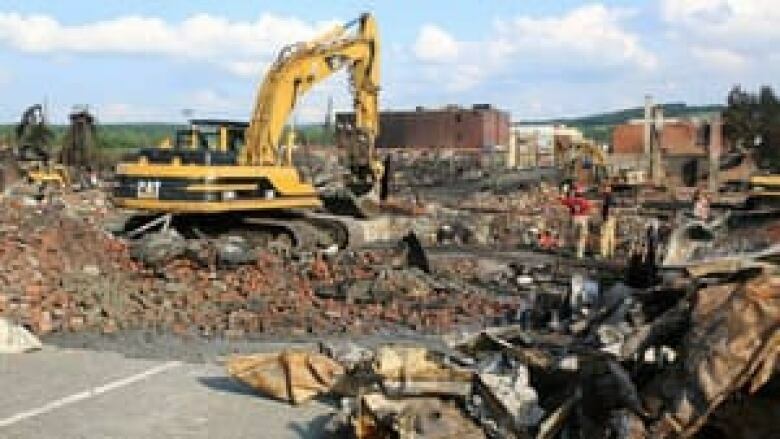 Lac-Mégantic's mayor announced last week that a letter was sent to MM&A, demanding that the company immediately reimburse the town for environmental cleanup costs. At issue was the $4 million forked over by the town of Lac-Mégantic to cover cleanup costs. The town dug deep into its coffers for the cash when work crews threatened to walk off the job over fears MM&A wouldn't pay them. MM&A has asked for the Quebec municipality to wait until Tuesday for its response to the legal notice. It has already missed last week's deadline, and the municipality has said it's now speaking with lawyers to evaluate a possible lawsuit. Lac-Mégantic Mayor Colette Roy-Laroche says she had hoped the letter would appeal to the company's sense of responsibility. "The fact there was no answer in 48 hours shows how little they care about Lac-Mégantic," she said. Karine Dube, spokeswoman for Lac-Mégantic Mayor Colette Roy-Laroche, insisted the legal deadline for MM&A to respond has come and gone — regardless of whether the company replies now. "We maintain, however, that there was no response to the (legal) notice," Dube said in a phone interview. Bourdon agreed that the municipality shouldn't have to foot the bill. When asked Friday whether it was normal that Lac-Mégantic should have to pay, MM&A board member replied: "It should be our insurance." The federal and provincial governments have each pledged $60 million towards emergency and long term aid.